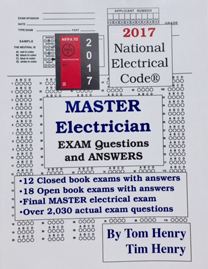 The 2017 Master Electrician Exam Questions and Answers workbook contains 12 closed-book exams, a 50 question true or false exam, 18 open-book exams, along with a 4 Hour 100 question Final Exam! Over 2,030 exam questions with answers, along with Code references. 338 pages total! You will also need to study other books on Calculations, Ohm's Law, Theory, Transformers, etc. in your proper preparation for the electrical examination. Includes Code questions, answers and Code references.